Close more deals with Nuclino as an easy knowledge base to consolidate playbooks, sales reviews, and more. Searching for information on a lead or browsing through your inbox looking for the perfect email pitch takes time away from closing deals and onboarding new customers. The best sales teams run a tight ship where information is organized, accessible, and easy to keep tabs on. 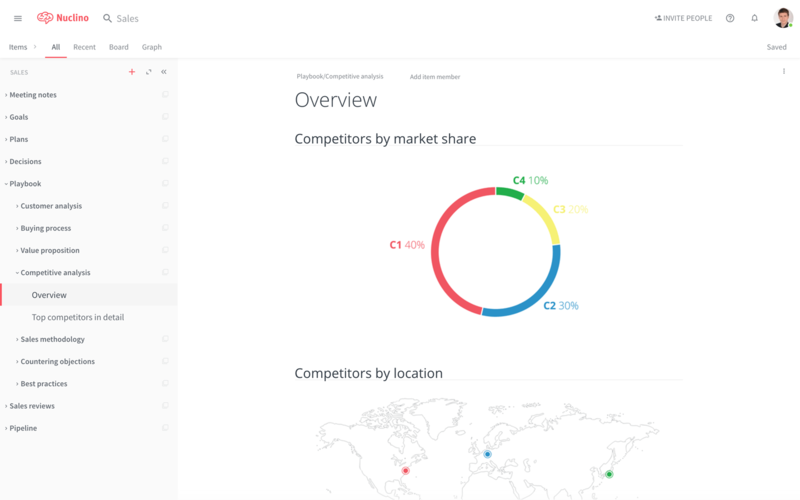 Nuclino allows your sales team to easily store and organize all your shared sales resources. Enable your account managers to maximize their potential by coordinating their sales efforts, capitalizing on best practices, and leveraging up-to-date information about their leads. With Nuclino, sales teams communicate in real time, make decisions together, and remain connected every step of the way, while staying focused on converting leads into happy customers. Create and iterate on sales playbooks that are shared with your team. Capture sales reviews to refer back to them at any time you want. Track the entire sales process in an easy and visual way. Collaborate with your team in real-time on any sales-related content. Add comments to content like sales playbooks to improve them. The board view provides an easy and visual way to track pipelines and more.